Home > Departments > Faculty > Christopher A. Williams Ph.D. Professor Christopher A. Williams earned a B.A. in Biology / Environmental Studies at Bucknell University, an M.S. in Watershed Science at Colorado State University, and a Ph.D. in Environmental Science at Duke University. He joined the faculty in the Graduate School of Geography in Fall 2008. 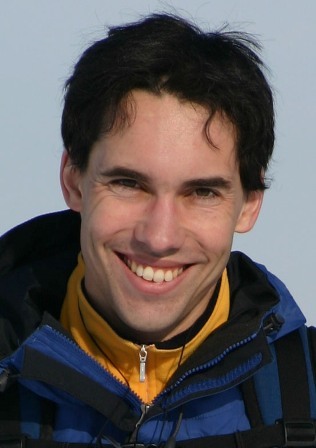 Prior to his arrival at Clark University he was a Research Scientist at Colorado State University's Natural Resource Ecology Laboratory, followed by Assistant Research Scientist with the Goddard Earth Sciences and Technology Center of the University of Maryland Baltimore County and based in the Biospheric Sciences Branch of NASA's Goddard Space Flight Center. Trained as a land surface hydrologist and terrestrial ecosystem ecologist, Chris investigates how earth's biosphere responds to natural and human perturbations such as severe drought events, bark beetle outbreaks, fires, harvesting, and land cover changes. His approach combines field, lab, and remote sensing data with process-based modeling aimed at understanding how terrestrial biophysical and biogeochemical processes are influenced by hydroclimatic variability and disturbance. His research spans leaf to global scales, with regional foci on Africa and North America. Williams CA,Vanderhoof M*, Khomik M*, Ghimire B* (2013) “Post-clearcut dynamics of carbon, water and energy exchanges in a mid-latitude temperate, deciduous broadleaf forest environment“, Global Change Biology, in press. Vanderhoof ME*, Williams C, Ghimire B*, Rogan J (2013) “Impact of mountain pine beetle outbreaks on forest albedo and radiative forcing as dervied from MODIS, Rocky Mountains, USA“, Journal of Geophysical Research – Biogeosciences, in press. Vanderhoof M*, Williams CA, Pasay M*, Ghimire B* (2013) “Controls on the rate of CO2 emission from woody debris in clearcut and coniferous forest environments of central Massachusetts”. Biogeochemistry, 114:299-311, DOI: 10.1007/s10533-012-9810-4. Cuba N*, Rogan J, Christman Z, Williams CA, Schneider LC, Lawrence D, Millones M (2013) “Modelling dry season deciduousness in Mexican Yucatán forest using MODIS EVI data (2000-2011)”. Marshall M, Tu K, Funk C, Michaelsen J, Williams P, Williams CA, Ardö J, Marie B, Cappelaere B, de Grandcourt A, Nickless, A, Nouvellon Y, Scholes R, Kutsch W (2013) “Improving operational land surface model canopy evapotranspiration in Africa using a direct remote sensing approach”, Hydrology and Earth System Sciences, 17, 1079-1091, doi:10.5194/hess-17-1079-2013. Schwalm CR*, Williams CA, Schaefer K, Baldocchi D, Black TA, Goldstein AT, Law BE, Meyers T, Monson RK, Oechel WC, Paw-U KT, Scott RL (2012) “Reduction in Carbon Uptake during Turn of the Century Drought in Western North America“, Nature-Geoscience, doi:10.1038/NGEO1529, Published Online 29 July. Ghimire B*, Williams CA, Collatz GJ, Vanderhoof M* (2012) “Fire induced regional carbon emissions and fluxes derived by parameterizing post-fire carbon flux trajectories for western United States forests: Accounting for variation across forest types, fire severity, and carbon pools”. Schaefer K, Schwalm C*, Williams CA, et al. (2012) “A model-data comparison of Gross Primary Productivity: Results from the North American Carbon Program Site Synthesis”, Journal of Geophysical Research - Biogeosciences, 117, G03010, 15 pp., doi:10.1029/2012JG001960. Williams CA, Reichstein M, Buchmann N, Baldocchi D, Beer C, Schwalm C*, Wohlfahrt G, Hasler N, Bernhofer C, Foken T, Papale D, Jung M, Schymanski S, Schaefer K (2012) “Climate and vegetation controls on the surface water balance: synthesis of evapotranspiration measured across a global network of flux towers”, Water Resources Research, doi:10.1029/2011WR011586. Williams CA, Collatz GJ, Masek J, Goward S (2012) “Carbon consequences of forest disturbance and recovery across the conterminous United States”, Global Biogeochemical Cycles, 26: GB1005, doi:10.1029/2010GB003947. Jung M, Reichstein M, Cescatti A, Richardson A, Margolis H, Arain A, Arneth A, Bonal D, Chen J, Gianelle D, Gobron N, Kiely G, Kutsch W, Lasslop G, Law B, Lindroth A, Merbold L, Montanani L, Moors E, Papale D, Sottocornola M, Vaccari F, Williams C (2011) “Global patterns of land - atmosphere fluxes of carbon dioxide, latent heat, and sensible heat derived from eddy covariance, satellite, and meteorological observations”, Journal of Geophysical Research – Biogeosciences, 116, G00J07, doi:10.1029/2010JG001566. Schwalm CR*, Williams CA, Schaefer K (2011) “Carbon consequences of global hydrologic change, 1948-2009”, Journal of Geophysical Research – Biogeosciences, 116, G03042, doi:10.1029/2011JG001674. Schwalm CR*, Williams CA, Schaefer K, Baker I, Collatz GJ, Roedenbeck C (2011) “Does terrestrial drought explain global CO2 flux anomalies induced by El Niño?”, Biogeosciences, 8, 2493-2506, doi:10.5194/bg-8-2493-2011. Williams CA, Hanan NP (2011) “ENSO and IOD teleconnections for African ecosystems: Evidence of destructive interference between climate oscillations”, Biogeosciences, 8: 27-40, doi: 10.5194/bgd-7-6323-2010. Williams CA (2010) “Integration of remote sensing and modeling to understand carbon fluxes and climate interactions in Africa”, In: Ecosystem Function in Global Savannas: Measurement and Modeling at Landscape to Global Scales, Ed. M.J. Hill and N.P. Hanan, CRC Taylor and Francis. Schwalm CR*, Williams CA, Schaefer K, and 45 co-authors (2010) “A model-data intercomparison of CO2 exchange across North America: Results from the North American Carbon Project site synthesis”, Journal of Geophysical Research – Biogeosciences, 115, G00H05, doi:10.1029/2009JG001229. Jung M, Reichstein M, Ciais P, Seneviratne SI, Sheffield J, Bonan G, Cescatti A, Chen J, de Jeu R, Dolman H, Eugster W, Gerten D, Gianelle D, Gobron N, Goulden ML, Heinke J, Kimball J, Law BE, Montagnani L, Mu Q, Mueller B, Oleson K, Papale D, Richardson AD, Roupsard O, Running S, Tomelleri E, Viovy N, Weber U, Williams CA, Wood E, Zaehle S, Zhang K (2010) “A recent decline in the global land evapotranspiration trend due to limited moisture supply”, Nature 467: 951-954, doi:10.1038/nature09396. Yi C, Ricciuto D, and over 100 co-authors including Williams CA (2010) “Climate control of terrestrial carbon exchange”, Environmental Research Letters, 5: 034007, doi:10.1088/1748-9326/5/3/034007. Beer C, Reichstein M, Tomelleri E, Ciais P, Jung M, Carvalhais N, Rödenbeck C, Altaf Arain M, Baldocchi D, Bonan GB, Bondeau A, Cescatti A, Lasslop G, Lindroth A, Lomas M, Luyssaert S, Margolis H, Oleson KW, Roupsard O, Veenendaal E, Viovy N, Williams CA, Woodward I, Papale D (2010) “Terrestrial gross carbon dioxide uptake: Global distribution and covariation with climate”, Science, 329 (5993): 834-838, doi: 10.1126/science.1184984. Schwalm CR*, Williams CA, Schaefer K, Arneth A, Bonal D, Buchmann N, Chen J, Law BE, Lindroth A, Luyssaert S, Reichstein M, Richardson AD (2010) “Assimilation exceeds respiration sensitivity to drought: A FLUXNET synthesis”, Global Change Biology, 16, 657-670, doi: 10.1111/j.1365-2486.2009.01991.x. Hanan NP, Boulain N, Williams CA, Scholes RJ, Archibald S (2010) “Functional convergence in ecosystem carbon exchange in adjacent savanna vegetation types of the Kruger National Park, South Africa”, In: Ecosystem Function in Global Savannas: Measurement and Modeling at Landscape to Global Scales, Ed. M.J. Hill and N.P. Hanan, CRC Taylor and Francis. Williams CA, Hanan N, Scholes RJ, Kutsch W (2009) “Complexity in water and carbon dioxide fluxes following rain pulses in an African savanna”, Oecologia, 161(3): 469-480, doi:10.1007/s00442-009-1405-y. Beer C, Ciais P, Reichstein M, Baldocchi D, Law BE, Papale D, Soussana J-F, Ammann C, Buchmann N, Frank D, Gianelle D, Janssens IA, Knohl A, Koestern B, Moors E, Roupsard O, Verbeeck H, Vesala T, Williams CA, Wohlfahrt G (2009) “Temporal and among-site variability of inherent water-use efficiency at the ecosystem scale”, Global Biogeochemical Cycles, 23, GB2018, doi:10.1029/2008GB003233. Williams CA, Hanan NP, Baker I, Collatz GJ, Berry J, Denning AS (2008) “Interannual variability of photosynthesis across Africa and its attribution”, Journal of Geophysical Research – Biogeosciences 113, G04015, doi:10.1029/2008JG000718. Archibald SA, Kirton A, van der Merwe MR, Scholes RJ, Williams CA, Hanan N (2009) “Drivers of inter-annual variability in Net Ecosystem Exchange in a semi-arid savanna ecosystem, South Africa”, Biogeosciences, 6, 251-266. Kutsch WL, Hanan NP, Scholes RJ, McHugh I, Khubeka W, Eckhardt H, Williams CA (2008) “Response of carbon fluxes to water relations in a savanna ecosystem in South Africa”, Biogeosciences, 5, 1797-1808. Williams CA, Hanan NP, Neff JC, Scholes RJ, Berry JA, Denning AS, Baker DF (2007) “Africa and the global carbon cycle”, Carbon Balance and Management, 2:3, doi:10.1186/1750-0680-2-3. Williams CA, Scanlon TM, Albertson JD (2007) “Influence of surface heterogeneity on scalar dissimilarity in the roughness sublayer”, Boundary-Layer Meteorology, 122(1):149-165, doi:10.1007.s10546-006-9097-x. Teuling AJ, Seneviratne SI, Williams CA, Troch PA (2006) “Observed timescales of evapotranspiration response to soil moisture”, Geophysical Research Letters, 33, L23403, doi:10.1029/2006GL028178. Williams CA, Albertson JD (2006) “Dynamical effects of the statistical structure of annual rainfall on dryland vegetation”, Global Change Biology, 12, 777–792, doi: 10.1111/j.1365-2486.2006.01111.x. Emanuel RE, Albertson JD, Epstein HE, Williams CA (2006) “Carbon dioxide exchange and early old-field succession”, Journal of Geophysical Research- Biogeosciences, 111, G01011, doi: 10.1029/2005JG000069. Williams CA, Cooper DJ (2005) “Mechanisms of riparian cottonwood decline along regulated rivers”, Ecosystems, 8: 1-14, doi:10.1007/s10021-003-0072-9. Williams CA, Albertson JD (2005) “Contrasting short- and long-timescale effects of vegetation dynamics on water and carbon fluxes in water-limited ecosystems”, Water Resources Research 41, W06005, doi:10.1029/2004WR003750. Williams CA, Albertson JD (2004) “Soil moisture controls on canopy-scale water and carbon fluxes in an African savanna”, Water Resources Research, 40, W09302, doi:10.1029/2004WR003208.